It’s another special date in the calendar as Mother’s Day has arrived in the UK and Ireland – as well as Jersey, Guernsey, the Isle of Man and Nigeria. If you haven’t managed to find your mum the perfect present then there’s no need to worry, as you can show how much you love her through the simple act of reading. The ‘Most Near, Most Dear’ section of A Little, Aloud with Love is dedicated to the love children have for their mothers, through fond remembrance and in both happy times and sorrow, with an extract from Cider with Rosie by Laurie Lee and the poem To My Mother by George Barker. And, of course, both A Little, Aloud and A Little, Aloud for Children have plenty of stories and poems that are perfect for sharing together. We’re absolutely delighted to hear that the anthology has been included in this year’s BookTrust School Library Pack. The School Library Pack is a reading for pleasure programme available to secondary schools and education providers for Year 7 students throughout England, encouraging students to try out new authors and books that they might not have considered reading before, take part in activities around their reading and support a culture of more frequent reading for pleasure within schools. The pack contains over 40 specially chosen books, sorted into the categories of Reluctant Reader, Future Classics and Short Story anthologies, to which A Little, Aloud for Children sits alongside titles from Malorie Blackman and David Almond. Last year 4,700 secondary schools across England received the pack, with wider reading being a huge success amongst both staff and students. Registration for the 2015-16 School Library Pack has now closed, and the packs will be delivered to schools by the end of March. Participating schools can visit the BookTrust website to download a range of supporting resources. It’s brilliant to know that even more young people will be able to access all of the great selections in A Little, Aloud for Children whilst in school – and hopefully they’ll get reading even more as a result! The book can be ordered on The Reader’s website, and we can assure you that it’s a treat. The Reader Organisation will be heading down to the Just So Festival 2013 on Saturday 17th August and we’ll be sharing stories from A Little, Aloud for Children in special family storytelling sessions throughout the day. Just So Festival is a weekend-long festival aimed at children, young people and their families, promising three jam-packed days full of imagination, magic and fun. The natural environment of the festival allows kids to experience the arts freely and safely, while there’s lots for adults to enjoy too. Over the three days, the festival will feature a broad range of musical, theatrical, visual and aural performances, workshops and installations, with creativity around every corner of the campsite for families to discover and delight in. On Saturday 17th, we’ll be in the ‘Telling Tales’ area of the festival campsite reading A Little, Aloud for Children to little and big kids alike. Come and find us for a magical adventure! For more information about the festival, ticketing and full line-up, see the Just So Festival website. You can also keep up with what’s happening in the run-up to the festival on Just So’s Twitter and Facebook pages. You can also now buy your copy of A Little, Aloud for Children on The Reader Organisation’s new look website. Haven’t got yours yet? What are you waiting for? Head to our Anthologies section to snap one up – and don’t forget to come back to the blog to tell us what you thought! Visitors to Croxteth Hall in Croxteth Park, Liverpool, have the opportunity to win a copy of A Little, Aloud for Children as the Croxteth crossword celebrates its 100th anniversary! As part of Liverpool’s In Other Words Literary Festival, Croxteth Hall are offering a puzzle with a difference; the Upstairs Downstairs Crossword features clues uncovering the hall’s great history As visitors explore ‘upstairs and downstairs’ in the Earl of Sefton’s home, they can fill in the crossword sheet to reveal the mystery name of a famous children’s author. 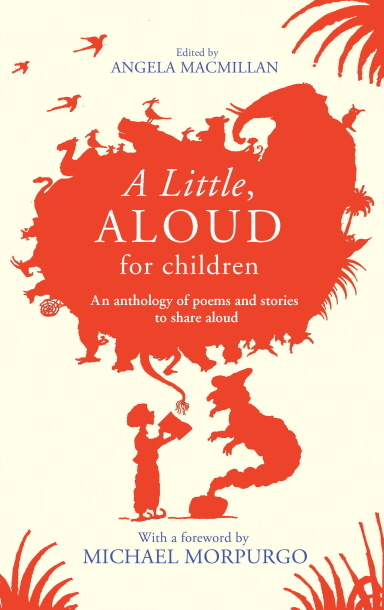 Correct entries will enter a prize draw to win a copy of our anthology of stories and poems specially selected to read aloud with young people, A Little, Aloud for Children. The book includes a rich and wide-ranging set of extracts from timeless classics such as Rudyard Kipling, Charles Dickens and Edith Nesbit, to stories from modern-day favourites including David Almond, Frank Cottrell Boyce and Neil Gaiman, and featuring a foreword from Michael Morpurgo, the book offers a truly magical melting-pot of prose and poetry that will delight every child. The Upstairs Downstairs Crossword is free with entry to Croxteth Hall and runs until 19th May. Good luck! Happy World Book Day to all our readers! World Book Day 2013 is being celebrated in great style, with lots of great book events happening in the UK, as well as an online festival that can be caught from anywhere in the world. ‘The Biggest Book Show on Earth’ is happening for one hour only, 11am-12pm today, featuring nine big name bestselling authors and illustrators, including Liz Pichon, Francesca Simon and Anthony Horowitz. A show not to be missed! As ever, school kids can also get their hands on £1 World Book Day tokens which will allow them to get one of eight special World Book Day titles for free or money off a wide range of other books and audiobooks. It’s the perfect day to pick up a book, and one ideal choice is A Little, Aloud for Children. There’s plenty of great stories to share, all packed into its pages. 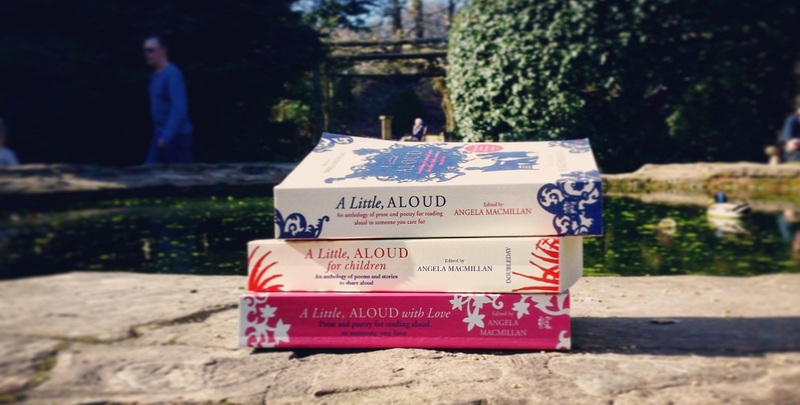 If you’ve been enjoying a Little, Aloud for Children for a while now, or if you’re just discovering it in just in time for World Book Day, why not tell us about your favourite bits over on our A Little, Aloud blog? We’d love to know what you’ve been reading, and who you’ve been reading it with. Perhaps you’re even celebrating World Book Day by dressing up as one of the characters in the stories – maybe a Mr Toad or even a certain gentleman named Dracula? Of course, World Book Day is just as much for adults as it is for kids. Though we’re certain that grown-ups will love A Little, Aloud for Children, there’s lots of brilliant stuff in A Little, Aloud too – a book so full it’s guaranteed to keep you going for well more than a day. Author The ReaderPosted on 7th March 2013 Categories A Little, Aloud for Children, Events, Reading for pleasure, UncategorisedLeave a comment on Happy World Book Day! We have a special guest writer on the blog today, children’s author Helena Pielichaty. She is the Patron of Reading at Ysgol Esgob Morgan in Denbighshire and was recently featured (along with A Little, Aloud for Children!) on BBC Wales Today. I am a children’s writer and an important part of that, for me, is visiting schools and libraries. I love doing visits as they bring back all the happy memories I had from my teaching days. For me, the best memories of all come from the times we just read; either me reading to the class or all of us reading our own books in silence. Magic. However, I’ve noticed on my school visits that many schools have misguidedly dropped the class reader through ‘lack of time’. How sad is that? One school that wasn’t like that was Ysgol Esgob Morgan. ‘You’ll like this lot,’ Bethan Hughes, the head of Denbighshire Library Services told me as we waited for Y6 to arrive at St Asaph Library. She wasn’t wrong; they were fabulous. The children were keen, motivated readers who lapped up everything I gave them. At the end of the session it was obvious that their teacher, Tim Redgrave, was largely responsible for their positive response. Talk about enthusiastic! I’ve done hundreds of sessions in schools, before and since, but that was one of the best. So when I received an email from Tim at the end of 2010 telling me he’d had this idea about a patron of reading and asking me if I’d take on the role, I didn’t hesitate. It’s a wonderful idea and I share Tim’s vision that every school should have one. The joy of the initiative is that it’s about helping schools to create life-long readers. Children who’ll willingly go to the library, choose a book, lose themselves in it, tell their mates about it, then go back for more. It’s also cheap. 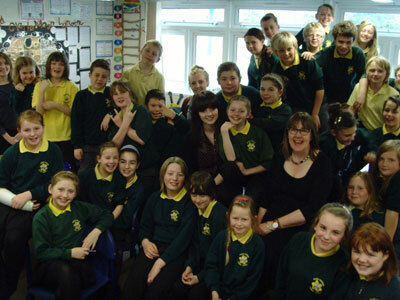 Apart from paying my fees as a school would for any author visit, there’s no cost involved. Schools who’ve ever had an author visit will know what impact that one hour or day can have; imagine if you had your own, special author for three years! ‘Magic dust that lasts’ indeed. The school has to be behind the project wholeheartedly for it to work, as does the patron. Luckily Tim has an amazing staff, headed by Lit Co Jenny Ritchie whose classroom is always a pleasure to enter. Last time I visited there was a display of giants on the wall as a result of a book I’d sent at Christmas (The Giant Book of Giants); the time before that a life-size model of a Tardis. What’s great is the patron of reading shares many of the aims of The Reader Organisation, something I realised when I first heard Frank Cottrell Boyce talking about The Reader Organisation at a conference. That’s where I first heard about A Little, Aloud for Children, too. What a great book. I’ve been recommending it to everyone since and chose it to read in front of the TV cameras last week. Stupid, I know. Most writers would have used the opportunity for mass product placement of their own stuff but for me, the patron idea isn’t what it’s all about. 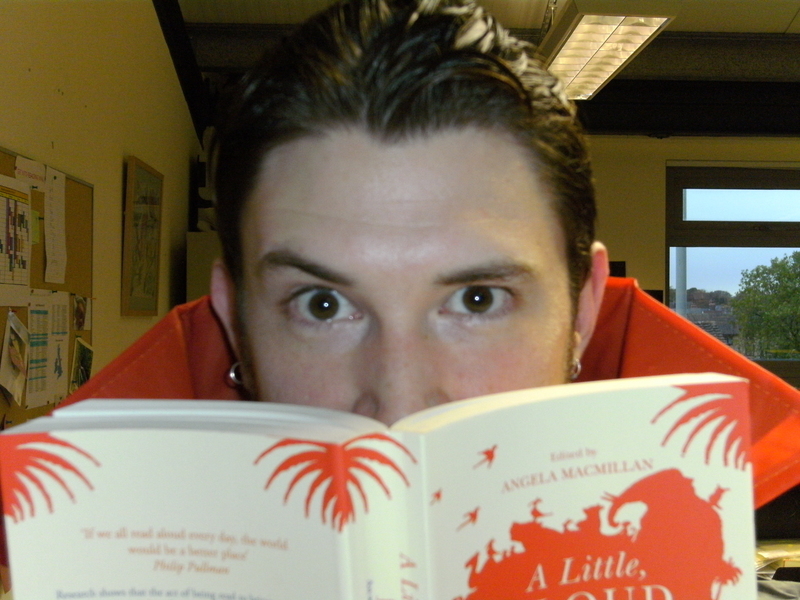 I knew A Little, Aloud for Children contains perfect bite-sized extracts ideal for a short reading on t‘telly. ‘The Snooks’ was perfect – just check out the expressions on the kids as I read it to them in assembly. Afterwards, one TA who’d have to leave before I’d finished asked how it ended and the head of governors bought it for her daughters. Any chance of commission? Click here to watch the full BBC TV news clip.